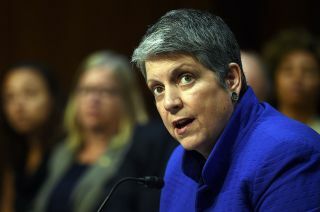 After a state audit found University of California administrators hid $175 million from the public while tuition increased, university system President Janet Napolitano apologized Tuesday for the way her office handled the investigation but disputed several of the audit's findings. Lawmakers at a hearing Tuesday said they are deeply troubled by the state auditor's finding that the UC president's office tried to interfere with the audit. State Auditor Elaine Howle told lawmakers she faced an unprecedented lack of cooperation from Napolitano's office while it was under audit. She detailed efforts by the president's office to edit responses from individual UC campuses to survey questions from auditors. "We felt that the surveys didn't reflect an independent voice from those campuses," Howle said. Napolitano said the $175 million figure was inaccurate. But she agreed her office should keep clearer budget plans and records, as the audit recommended. She told lawmakers Tuesday the money in reserves totals $38 million, which she described as a "prudent and reasonable" amount set aside for unexpected expenses. Most of the $175 million Howle identified is already committed to important university programs, Napolitano said. "My team made the decision to work with our campuses to ensure they understood the purpose of the audit and the audit's scope," Napolitano told lawmakers. "I am sorry that we did it this way because it has created the wrong impression and detracted from the important fact that we accept the recommendations in the audit report." Assemblyman Jose Medina said he found the auditor's description of interference by the president's office particularly concerning. "To interfere in that process, to me, is undefendable," the Democrat from Riverside said. "I am extremely bothered that there was tampering." UC administrators amassed $175 million in undisclosed surplus money over four years even as the university system raised tuition and asked the state for more funding, according to the audit released last week. "They are not putting California students and families first, particularly with their budget," said Assemblywoman Catharine Baker, a Republican from Dublin in the East Bay. "This is unbelievable for an institution that has in its hands the education of California students and hundreds of millions of dollars in taxpayer money and student fees." In the report, Howle said state lawmakers should increase oversight of Napolitano's office. Baker and several other Republican lawmakers are asking for the Democratically controlled Legislature to subpoena financial records and communications related to the surplus money identified by the audit. The UC Board of Regents in January voted to increase in-state tuition and fees $336 next academic year. Some lawmakers called for a reversal of the tuition hike in the wake of the audit.